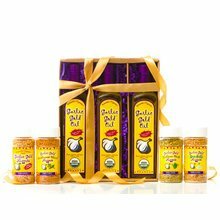 Garlic Gold Vinaigrette Gift Box includes: Classic Balsamic Vinaigrette, Red Wine Vinaigrette, plus our well-loved Meyer Lemon Vinaigrette. 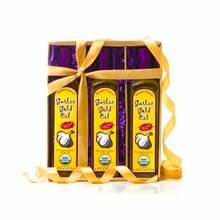 Garlic Gold Vinaigrettes are a fabulous blend of pure, organic extra virgin olive oil (infused with organic garlic), plus organic cask-aged balsamic vinegar of Modena, organic red wine vinegar, or organic Meyer lemon juice. 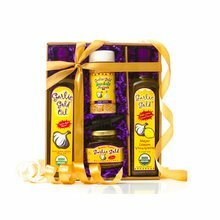 Garlic Gold Vinaigrette Gift Box includes: Classic Balsamic Vinaigrette, Red Wine Vinaigrette, plus our well-loved Meyer Lemon Vinaigrette. 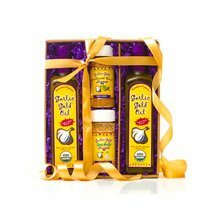 Garlic Gold Vinaigrettes are a fabulous blend of pure, organic extra virgin olive oil (infused with organic garlic), plus organic cask-aged balsamic vinegar of Modena, organic red wine vinegar, or organic Meyer lemon juice. We add organic Italian seasonings, sea salt and organic black pepper - magnifico! Try the Classic Balsamic drizzled on a caprese salad, or use it as a dipping sauce for artichokes/veggies. Makes a great marinade for beef. The Red Wine Vinaigrette adds great taste to any salads; or use as a marinade for chicken/fish. The Meyer Lemon Vinaigrette is great for those who have trouble tolerating vinegar - it's vinegar-free. 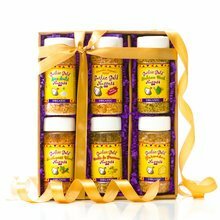 Makes a fantastic dipping sauce with shrimp; great on seafood salads and steamed or grilled veggies.